Hamilton’s Nine-Hour League continued to push for its goals for a few more weeks. But by late May, it was clear the movement had fizzled. A number of employers who had locked out workers before the parade reopened their plants, but with ten hours as the standard work day. Lists of employers adhering to the ten-hours’ pledge were again circulated in city newspapers. 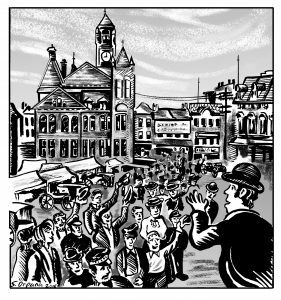 An artist’s rendering of James Ryan addressing a crowd in Old Market Square. This was Ryan’s last appearance in the historical record.